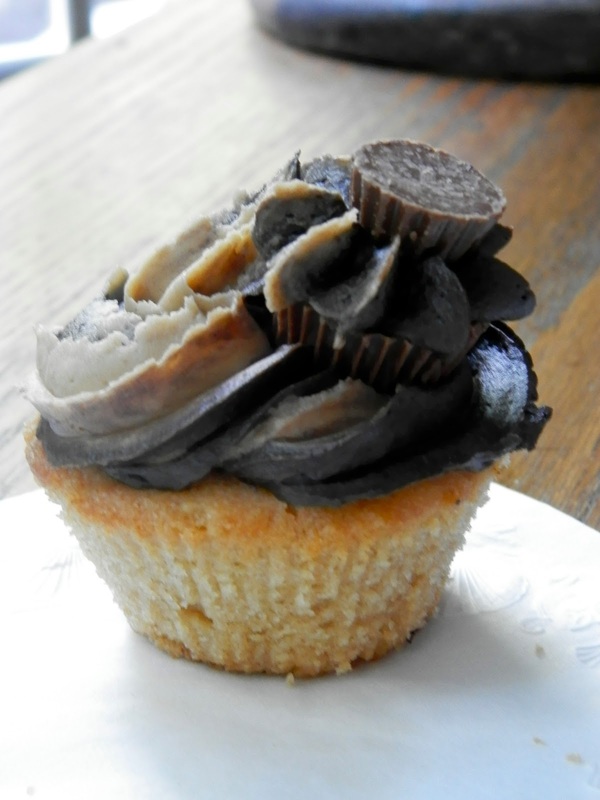 Now, these are not your ordinary Reese's cupcakes. I was flipping through some cookbooks because my uncle was in town, so of course we needed baked goods, and I found an assortment of recipes and put them together. I decided that instead of doing a chocolate cupcake base (boooring, and done so many times before), I decided to do a peanut butter one, because I don't think I've ever had a peanut butter cupcake. Like ever. That was definitely a good choice. If I were to bake them again, I would definitely only keep them in for the suggested 20 minutes, because they got a wee bit dry. But they were still good. 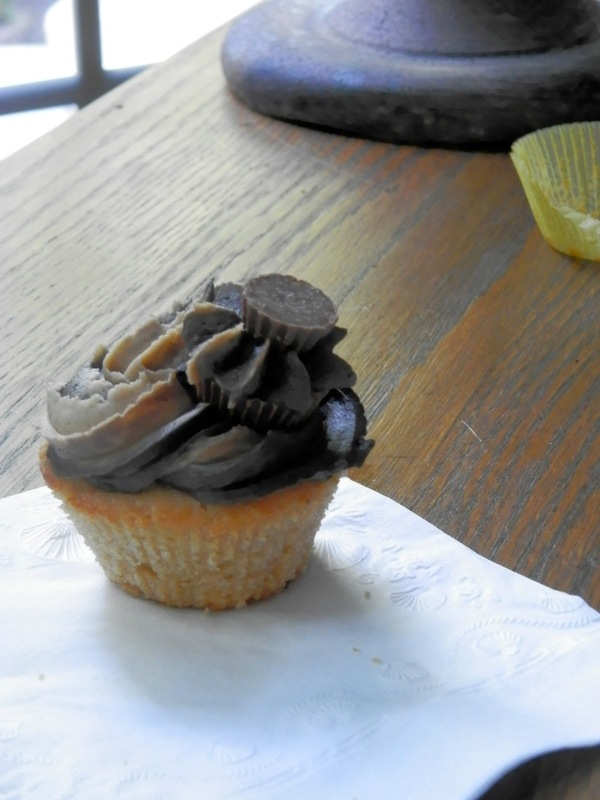 And for the frosting, I simply could not decide whether to use chocolate or peanut butter frosting. Chocolate frosting would be a little boring (because I used Joy the Baker's again :), which as delicious as that is, I have used it quite a lot), and peanut butter would make it just a plain peanut butter cupcake, which would be overwhelming. Solution? I swirled them together. Verdict? Delicious. Amazing. Stupendous. Spectacular. (And no, I did not use a thesaurus to come up with those words). Don't they look awesome? Progressively smaller cupcakes stacked on top of each other that aren't really cupcakes but are actually Reese's? So I decided I had to try this. Haha, no. It didn't really work out like it looked in the picture (obviously). But it still tasted delicious. That's what really matters. It's the true meaning of baking. But I hope to attempt this again sometime soon with a better strategy. So it looks as awesome as it does in that picture. Because of the sort of smushed-in look of my Reese's, these aren't the most photogenic things in the world. But just imagine the taste. Doesn't it just make your mouth water? Now you should go make some. Preheat the oven to 350 degrees Fahrenheit. Place 18 paper baking cups in muffin pans. Combine the butter, sugar, flour, baking powder, salt, eggs, and buttermilk in a large bowl and beat with an electric mixer until smooth, about 2-3 minutes. Stir in the peanut butter until well combined. Spoon the batter into the cups. Bake for 20 to 22 minutes. Remove pans from oven and cool for five minutes. Then remove the cupcakes and cool on a rack. Place the peanut butter and butter in a large mixing bowl. Blend with an electric mixer on low speed until fluffy, 30 seconds. Stop the machine. Add the confectioners’ sugar, 3 tablespoons milk, and the vanilla. Blend with the mixer on low speed until the sugar is well combined, 1 minute. Increase the speed to medium and beat until the frosting lightens and is fluffy, 1 minute more. 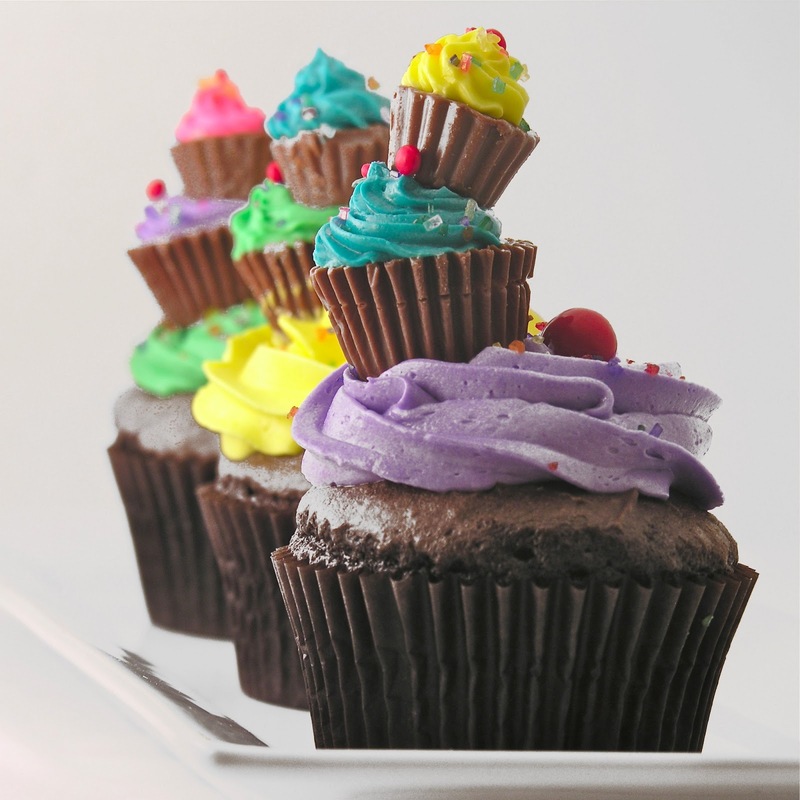 Blend in up to 1 tablespoon milk if the frosting seems too stiff.